...It Just Reloads! UGA I ended "The Drought" against Tech,won the 1959 SEC championship, and watched Fran Tarkenton and the Dawgs whip Missouri in the 1960 Orange Bowl. UGA II was the mascot for the SEC champs of 1966 and 1968.. He supported such Georgia greats as Bill Stanfill and Jake Scott. UGA III was named to "Animal Who's Who" and closed out his illustrious career with a National Championship victory over Notre Dame in the Sugar Bowl. UGA IV sported a bow tie and formal collar to be Herschel Walker's honored guest at the 1982 Heisman Trophy banquet. He closed out a fantastic career with 77 wins. 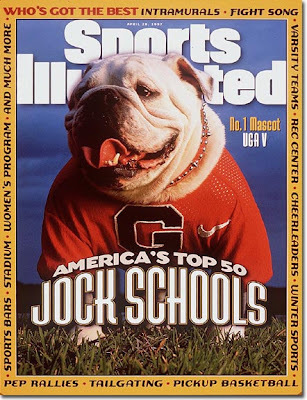 UGA V was featured on the cover of Sports Illustrated in 1998 and earned a featured role in the Savannah based movie "Midnight in the Garden of Good and Evil". He earned the unending love of Georgia fans everywhere after his famous lunge at an Auburn player in the quadruple overtime Dawg win in 1996. UGA VI, the heaviest of all the UGA's, was the winningest of all-time with 87 victories. He ushered in the Mark Richt era with two SEC championships to go along with seven bowl victories. UGA VII will be named and in place "Between the Hedges" soon. As you can see, each of his predecessors accomplished great things and he will as well. It will be well worth the experience to see just what those milestones turn out to be. As for all the white English bulldogs who set the table for him, they might be gone, but they never will be forgotten. And that brings to mind another Georgia expression: "Once a Dawg...Always a Dawg"!